Language Log » Who would not weep, if E. B. White were he? Who would not weep, if E. B. White were he? For the upcoming 2009 Book Expo in New York, the Perseus Book Group (of which my publisher PublicAffairs is a member), has organized a project to collaboratively create and publish a book in as many formats as possible within 48 hours. The text of the book will consist of submissions from the public of the first sentence of a yet-to-be published sequel of some well known book — A Tale of Three Cities, To Fricassee a Mockingbird; you get the picture. Submissions are welcome. Since I sort of suggested this idea to them, I got roped into writing the introduction to the book, and also felt obliged to make a contribution. 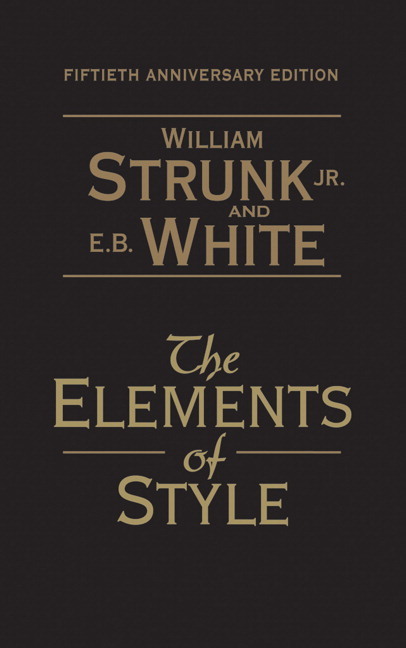 Inasmuch as The Elements of Style has been on the minds of everybody around here recently, I had the idea of imagining how Pope would have dealt with the work in a sequel to the Essay on Criticism. I had intended to write just a few introductory couplets, but at a certain point the whole world started speaking in iambic pentameter, and the thing just growed. Writing, or Telling others how to do’t. Three-movie Deal, and Pad in Malibu. To USAGE BOOKS, routinely grants a Waiver. With Readers in the Eisenhower Age. Are English still, but English calcified. They weigh the more the less that they make Sense. The more its Rules seem precious and abstruse. By us who know the Radix of the Word). The first is butch, the second feebly femme. Put ev'ry Word where it is meant to be. As Meat on which all Writers should be rear'd. A little GRAMMAR is a dang'rous thing. I didn't know that English had ever capitalised Nouns in the German Style. Nice pseudo-Popery. But surely S&W would never have uttered such a barbarous solecism as "by we who know"? Nice job on the noun capitalization and poetic-phonetic spelling. Pope quotations published in America (Britain) now routinely use modern American (British) spelling. But Pope himself wrote at a time when the -our and -or spellings were *both* current in Britain (see the OED's disquisition on the subject under "honour, honor n."). In the interest of historical accuracy, do we know which one Pope actually used in his manuscripts? Pope … did rhyme "obey" with "tea"
Pope was not the only one to use what seem to moderns like strange or incorrect rhymes: the words did rhyme at the time, or most likely there was still some fluctuation in the pronunciation, giving poets some leeway: for instance in Blake's poem "Tiger", where eye rhymes with symmetrye. It is never the case that really different vowels or diphthongs are made to rhyme together, but only a select few (the ones concerned here are all front vowels and corresponding diphthongs). "Obey" & "tea" may well have been a good rhyme to Pope; the OED says: "The original English pronunciation (te;), sometimes indicated by spelling tay, is found in rimes down to 1762, and remains in many dialects; but the current (ti;) is found already in the 17th c., shown in rimes and by the spelling tee." Blake's, at a guess, is an out&out sight rhyme. Blake's, at a guess, is an out&out sight rhyme.. I don't believe it. Even a lousy poet would not have used such a poor visual match if it didn't correspond to a genuine phonological match in their own dialect. Are the non-standard rhymes in Robert Burns just sight rhymes? Interestingly, the old pronunciation is also retained in Irish family names, such as Reagan, Shea, Beatty, and Yeats (in contrast to British family names such as Keats)." That's lovely work, Geoff–many thanks. If you should ever be minded to expand it, consider throwing in a "limping Alexandrine" or two, as Charles Lee did in his "Proem" to The Stuffed Owl, which invokes Cacohymnia, the Muse of Bad Verse. Blake's, at a guess, is an out&out sight rhyme. It it's 'eye' and 'symmetrye', it's probably not just sight rhyme. Marvell, at least, made the equivalent (to us) non-rhyme twice in 'to his coy mistress' – 'try' and 'virginity', and 'lie' and 'eternity'. I'd guess there was some earlier variation in the pronunciation, though by Blake's time it might have only been a 'poetic' rhyme not found in common pronunciation. The modern -y ending comes down as a short vowel. For the [aɪ] rhyme, there must have been some long vowel variant in Middle English that was affected by the great vowel shift. -y comes from Old English -iȝ,(not sure how to get the insular g to show up), so maybe there was a long variant that came from compensatory lengthening from loss of the ȝ. I wish the OED had stuff on this, but it's silent on the historical pronunciation of it. I suspect there's more to this than just the phonetic value of the final syllable of symmetrye. The line would be metrically striking even if the preceding one ended in stressed /iy/; e.g., if Blake had written "What immortal chimpanzee/Could frame thy fearful symmetry?" For one thing, the final line is in regular (eight-syllable) iambic tetrameter, closing a stanza whose first three lines are headless (seven-syllable) iambics. For another, it's the first line in the stanza whose concluding syllable doesn't bear primary stress, and compels the impression of an unnatural stress pattern on symmetrye. So the line isn't metrically or phonetically parallel to what precedes; its poetic "symmetry," that is, is disturbing and "fearful". And you could go on to say that the "fearful [a-]symmetry" is brought to conclusion in the final stanza, which is identical to the first save that "Dare frame" is substituted for "Could frame." Lines 10, 11, and 20 are also not headless (anacephalous?) (line 6 also uses disyllabic 'fire', which strikes me as a rare thing). I don't think the use as a line end of non-primary-stressed syllables is all that rare. Shakespeare's first sonnet rhymes 'never die' with 'memory' (thus raising both the rhyme and rhythm issues), and 'gaudy spring' with 'niggarding'. I'd guess this is a poetic remnant of the more fluid stress in Middle English polysyllabics ('melodye' with 'open ye', and hundreds of other Chaucer examples, with '-y' and '-ing' taking end-line stress pretty often). I'm really not that clear on the history of the calcification of stress patterns; maybe that sort of stress shift was still productive for Shakespeare. Of course, the pattern having regular derivation and historical precedence doesn't mean Blake's not using it for a reason here, per Geoff; 'symmetry' is the only non-monosyllabic line end. also, for pronunciation of symmetry I'd draw a parallel with poetic diphthongal 'wind' and 'wound' – natural and, in those cases, even more regular phonetic derivations that were locked out of standard speech, but retained in poetic. parvomagnus: thank you for citing Marvell's rhymes, which are absolutely relevant. And GN, the metrical problem is exactly the same in Marvell as in Blake: in all these cases there is a native monosyllable for which the chosen rhyme is the final syllable of a French or Latinate multisyllabic word. But the Latinate words did at one time end in a stressed syllable, continuing the French stress pattern, and so did the corresponding words in Middle English. It would be too much to assume that Marvell and (later) Blake both chose to use a rhyming pattern which to modern eyes and ears is abnormal both phonologically and metrically. Blake may have been archaizing in this case, but Marvell most probably was not. The words do not rhyme at present because only in the monosyllabless have the vowels, being under stress, undergone the Great Vowel Shift, while the unstressed vowels of the polysyllables have not, but there was probably a time of fluctuation where the vowel shifted (though perhaps not yet as far as the current diphthong) under the conservative pattern of final syllable stress. while those speakers who destressed the final vowel also did not shift it. If so, conservative literary style would have been more likely to shift the vowel, thus allowing the rhyme, while colloquial pronunciation destressed the vowel and preserved its quality. "Sir," said he, "what entitles Sheridan [this is Thomas, father of Richard Brinsley S. the playwright; he had undertaken to write a pronunciation dictionary] to fix the pronunciation of English? He has, in the first place, the disadvantage of being an Irishman; and if he says he will fix it after the example of the best company, why, they differ among themselves. I remember an instance: when I published the Plan for my Dictionary, Lord Chesterfield told me that the word great should be pronounced so as to rhyme to state; and Sir William Yonge sent me word that it should be pronounced so as to rhyme to seat, and that none but an Irishman would pronounce it grait. Now here were two men of the highest rank, the one the best speaker in the House of Lords, the other the best speaker in the House of Commons, differing entirely." The quotation is remembered, to be sure, because the Irish (and older) pronunciation became standard in this word and a very few others such as break and steak, with almost all the rest of the words in "ea" shifting to [i]. As I understand it, the idea here is that the final vowel in symmetry etc. had a tense variant that underwent the Great Vowel Shift and wound up as [ay] along with the tense /i/ in, e.g., eye, and thus that rhymes of this type were exact rhymes for Marvell. This is an ingenious suggestion and as far as I know a novel one. But it raises several questions. 1. An /ay/ pronunciation in words like these isn't mentioned by the 16th & 17th century orthoepists and grammarians, to my knowledge. Miege (1688), for example, distinguishes three pronunciations of the letter /y/: as analogous to French /i/ in angry, ready, etc; as like "the broad English i" in my, cry, etc. and as an "e masculine" in "substantives derived from the Latin," such as charity, amity, and liberality. This last, presumably, was a barred i or other centralized vowel. (A barred i survives or survived until recently in these words in RP — Peter Ladefoged had it in city.) Moreover there was orthographic confusion in Early Modern English between the final vowel of these words and short i: Wyld speaks of "the evidence so common since the fifteenth century of the levelling of the vowels in in unstressed syllables under an indeterminate sound which the writer found it hard to express," citing mid-16th c. spellings of pity as pete, etc. 2. Where variation of this sort exists, it usually leaves some lexical diffusion, dialect variation, or doublets in its wake and occasions some discussion. John Cowan cites tea and tay, and there's independent evidence for a near merger of these word-classes in the writings of contemporaries and dialect variation that John mentions, not to mention the lists of homonyms in some 18th-c. schoolbooks that listed pairs like heat and hate etc. And fill the Gen'ral Chorus of Mankind! Where Denham's Strength, and Waller's Sweetness join. One notable point here is that this confusion was phonetically conditioned, limited to vowels before /n/, /l/ and some other sonorants, particularly when preceded by /p/ and /b/ (as in point and boil). Nobody rhymed toy and sigh as far as I know. So the rhymes here turned on a perception of phonetic closeness or identity, not simply a rhyming convention. A second is that the confusion left several doublets in its wake (rile and roil, for example) as well as some dialect variation: Dickens had his lower-class characters saying spile for spoil and jint for joint. A third is that the confusion was noted, and sometimes criticized as "abusive," by contemporary writers. To my knowledge none of these is in evidence with the final vowel of symmetry etc. If the final vowel had a variant pronunciation as /ay/ it didn't result in any lexical diffusion or doublets either in Std. English or local dialects and wasn't mentioned by contemporaries. That doesn't mean it couldn't have happened, but if you're proposing it as an explanation for these rhymes you'd want some independent corroboration. Stemm'd the wild Torrent of a barb'rous Age. But begg'd is more usual, I think. If the verb in that last one had been twin, we would have had twinn'd, so Pope's spelling keeps things clear and distinct. This makes a sort of sense, because that /ai/ sound (or Popish equivalent) is spelled with either y or ie, but not with i alone in such a position. And the World's Victor stood subdu'd by Sound! That only makes Superior Sense belov'd. And beg'd revenge for her insulted bed. This version of the line is found in several other editions from the 19th and 20th centuries. The geminated version appears in more editions, but not before 1763 — its later preponderance may simply reflect its being more familiar for modern readers. Similarly, "another Crowd/Prefer'd the same Request" appears in a 1718 printing of "The Temple of Fame" and 13 other editions, including some modern ones. Here again the geminated version is more frequent overall, but doesn't first appear until Warburton's edition of 1787. Anyway, this all has more to do with the preferences of printers and publishers and later editors than with Pope's actual ms practice. And early 18th-c writers used both variants in their letters. GN, thank you for your long reply. Of course it would be nice to have independent corroboration, but finding the same complex rhyming pattern in two different poets in two distinct periods of the language seems to demand a common explanation which goes beyond the "eye rhyme" description. The examples of fluctuation (eg tea, great) that you give, where one pronunciation eventually won out, are from everyday words in common use, not of rhymes similar to the Marvell-Blake ones where one of the words belongs to a higher register. A wider search not only through the works of major poets but of lesser ones, or for instance through popular songs, comedy, or other works more likely to include examples of colloquial speech or to satirize "high-falutin" speech, might give more results. p.s. I don't know how one would do a computerized search for such patterns, it might have to be done just by someone deciding to notice such things while reading those types of materials for other purposes. – Shakespeare, in the first sonnet. This sort of thing seems to taper off in later poetry, along with the line-final use of Latinate -ty nouns. This is what one might expect if the phonological fluctuation which I hypothesized in final syllable (at least in conservative literay convention) was getting settled in favour of the unstressed, undiphthongized vowel. …along with the line-final use of Latinate -ty nouns. perhaps because the final syllable of these words was generally unstressed by then and the iambic rhythm was no longer possible with these words at the end of a line of verse. Now I see your red comment on my earlier post, Geoff. Yes, of course it is more a matter of editorial practice. But then, editorial practice is pretty much weighted towards -CCed being rendered as -CC'd, I think – and certainly where the C is r, n, m, etc. A safer practice in a parody, I think. Interesting to speculate as to why treatment of g should be less regular. I can think of a couple of reasons. One more thing: the versatile rhymability in 'try' might just reflect the older value of the diphtong, [ɪj]. Its transition to [əj] happens, in wikipedia's chart, about the same time these rhymes become less common, in the middle of the 17th century. Actually that makes way more sense to me than stealth variants, but is admittedly less interesting. parvomagnus: Thank you for the extra bit of research. I agree with you, and this is exactly what I meant by "the vowel shifted (though perhaps not yet as far as the current diphthong)": [i:] did not shift to [aj] in one fell swoop but had intermediate stages and the phonetic gap between the two components of the diphthong took a while to widen to its fullest extent. * It is not surprising then that a rhyme which was apparently frequent until the 17th century (even though perhaps starting to get archaic) was later abandoned when it was no longer justified by phonological reality (for both vowel quality and stress). This makes much more sense to me than claiming that some of the best-known, most admired English poets made egregious phonological and metrical errors, in just this particular set of rhymes. *Actually, the phenomenon erroneously called by American linguists "Canadian raising" (where the [a] of [aj] or [aw] is a schwa when the diphthong occurs before voiceless consonants) is not a development away from "standard" [a-] initial diphthongs; instead it shows that the phonetic gap has not yet fully widened everywhere in the English-speaking world and an allophonic higher, centralized pronunciation of the vowel nucleus is still current in phonologically conservative parts of the country, including Nova Scotia where I live. The "tay" of the song appears to me, anyway, to be stage Irish. Heaven is filled with joy. Of course, it may well be that the translator wrote this because he had seen 'join' rhymed with 'line' in older works, and had not fully grasped the rules which governed it. Even a lousy poet would not have used such a poor visual match if it didn't correspond to a genuine phonological match in their own dialect. There are some imperfect rhymes which simply are accepted conventions, which those used to the kind of poetry in question hardly notice; and these are not all visual matches. For instance, Pope (in the famous 'Know then thyself' passage) rhymes 'rest' with 'beast'. These may have been true rhymes at one time, but their retention certainly doesn' t imply that they are at the time of use. Just to divert matters in another but analogous direction: A composer of musical shows and I have long argued over whether there are any slant rhymes in (American Song Book) stage musicals versus rock and rap, etc. where they appear often. His escape hatch is always personal dialect, e.g., "The Wizard of Oz is one because…because of the wonderful things he does…." 'Well, that's the way Harburg pronounced it.' Perhaps a stronger albeit anecdotal argument is that Johnny Mercer has been described as so embarrassed by 'whistle/trestle' in "Blues in the Night" that he often refused to listen to the song. Coments? moremarvellmore: Not merely personal dialect: I assure you that "because" and "does" are a perfect rhyme for me, and I'm not alone in this. On the other hand, been/green (in a very different song, one I sing rather more often) is not normally a rhyme for me at all, and I have to distort my pronunciation to make it so. The wikipedia article on "slant rhyme" says that while it became prominent in English poetry with Yeats (plus Hopkins & Dickinson who didn't get read while they were still alive – but where did they get the idea from? ), it can be traced back at least as far as Henry Vaughn. Vaughn is something of a favorite of mine, but I can't immediately recall having noticed any obvious non-rhymes in his work where I would have expected a rhyme. But maybe that's because I know I don't know much about 17th century educated-Welshman-speaking-English pronunciation, so I subconsciously assume anything that "looks funny" simply reflects differences between Vaughn's pronunciation and my own. One would need to know much more than I do about the history of English poetry and the practice of particular poets (separate from the history of English pronunciation more generally) to know how compelling the must-have-rhymed-back-then hypothesis is with respect to many of the interesting examples given in this thread. Mawmaw, luk, your beeftay's fizzin over! "Beeftay" obviously meant, among many other things no doubt, to echo local Irish pronunciation of beef tea. Hats off, Mr. Nunberg, for the prize Poperee, especially the final snook in the concluding couplet, using "bling" in the rhyme as if it were an18th century word, and the deft parody in "A little GRAMMAR is a dang'rous thing"! Where there are no neighbors to squawk. That sort of thing. But those aren't slant rhymes. And a little googling reveals that the word "tea" is a borrowing from Chinese as spoken in Fujian province, where the plant and beverage are pronunced "teh." e.g. http://www.theteafaq.com/tea/information/tea-etymology.html Most English dialects don't like short vowels other than schwa at the end of a word – diphthongs are more usual – so "tay" would be the natural way for an English-speaking person to pronounce "teh." How it became "tee" and why the spelling became standardized as "tea" are questions I will leave to someone else. I though a bit of evidence from Herbert might be worth submitting, so I read the first hundred-odd lines of his "The Church Porch" and sure enough found "thereby" rhymed with "povertie" at lines 104 and 106. Also the following rhymes, which are none of them exact rhymes in (my variety of) modern English: have/grave, blood/understood, foul/soul, flies/sacrifice, devest/beast, fearing/swearing, are/spare, both/froth, severe/souldier (= soldier, trisyllabic), blurr'd/sword, sloth/cloth, most/lost, live/five. My guess is that most or all of these were exact rhymes, or very close rhymes, in Herbert's day. @ J. W. Brewer Vaughn is something of a favorite of mine, but I can't immediately recall having noticed any obvious non-rhymes in his work where I would have expected a rhyme. I have just scanned (with my eyes, I mean) several pages of Vaughan's poems, looking at the rhymes, and have found the same thing. Sticking to the [aɪ] – [ɪ] rhymes we've been discussing, here's what I find in Vaughan: lye/Tragedy, me/sympathie, dye/legacye, me/harmonye, vanities/Eyes, wee/adversitie, lye/Alchymie, dye/credulitie, see/vanity, by/vanitie, he/Philosophie, she/Libertie. That's a round dozen collected from between pages 3 and 21 of my Oxford English Texts edition. It's evident — isn't it? — that Vaughan and other poets found polysyllables ending in -ie or -y conveniently rhymable sometimes with monosyllables that we now pronounce [aɪ] and at other times with monosyllables that we now pronounce [i]. So how did Vaughan pronounce them? I don't know. Slightly off-topic perhaps, but here's some delightful mock-Chaucerian poetry from Bill Bailey. He contrives to rhyme 'dominion' with 'one', uses a weakened rhyme (knee/puppetry) as a sort of anchor for a swarm of unstressed /i/ ending that fan out in all directions, and manages to turn pub/rub into a feminine rhyme. @ Simon C.: unfortunately the online sources (at least findable within a few minutes) that finger Vaughn as an earlier practitioner of slant or half rhyme don't give any actual examples or a cite to a more scholarly source that might. So the mystery continues. But I've learned some new things about current English dialect variation, e.g. that there are some pairs that rhyme for me that apparently don't rhyme for some others, such as because/does & sloth/cloth. Re: the Johnson quotation: "I remember an instance: when I published the Plan for my Dictionary, Lord Chesterfield told me that the word great should be pronounced so as to rhyme to state; and Sir William Yonge sent me word that it should be pronounced so as to rhyme to seat, and that none but an Irishman would pronounce it grait." What would be/would have been the difference between the first and third pronunciations? To me (British English speaker), they are identitical. I once spoke to an English professor of linguistics who said that when a child (I don't remember where, but I think it was in a rural area) he and his schoolmates pronounced "wait" and "weight" differently. I guess that "wait" may have had a slightly lower vowel and "weight" a higher one than the standard diphthong (I heard eight pronounced almost like eat in Scotland). That may have been the difference between Chesterfield's "state" and the Irish "grait" (and do we know exactly how Yonge pronounced seat, since he made his comment in writing?). The way I read it, there is no distinction between the first and third pronunciations. Chesterfield says that it should be pronounced to rhyme with state; Yonge says that it shouldn't (unless one is Irish) – 'grait' is just his way of writing the pronunciation which rhymes with 'state'. Andrew, but Yonge did not write "grate" as the Irish pronunciation. Marie-Lucie: No, but why should he? He wasn't actually replying to Chesterfield. Chesterfield, on one occasion, said it should be pronounced to rhyme with 'state'. Yonge, on another occasion, said it should not be pronounced 'grait'. It seems to me perfectly possible they are referring to the same pronounciation, which could naturally be written either 'grate' or 'grait', the two being equivalent in standard English English. Andrew, yes, they are equivalent nowadays, but the point is whether they were so in Johnson's time, given that there were more differences then between the regions, even for educated people. I'm not sure that differences between the regions are relevant to my point; in the speech of one region, 'grate' and 'grait' would naturally be interpreted as standing for the same sound, though just what that sound is would differ from one region to another (even today). I think perhaps the real source of the difference between us is that you are reading 'Only an Irishman would say grait' literally, as referring to a sound which actually is found only in Irish English. But I think this is improbable; Yonge is condemning a usage – he is saying it is un-English – this is why Johnson takes his remark to be relevant to the point at issue. But in that case, he must be referring to something which an Englishman might be tempted to say. Andrew, I agree with your second paragraph, the writer is condemning a usage that he attributes (rightly or wrongly) to the Irish, but there would be no point in condemning it if it was not used in some English circles. "… a tiny scatter of [E:] words stay at expected [e:] or thereabouts in Southern English (break, yea, steak, great, drain) and the merger is much weaker in many Irish dialects." (p. 82 in 2008 paperback edition). This means that in many words Irish must have [e:] where standard English has [i:]. See also my comment above about wait/weight in an English dialect: possibly some reflexes of [E:] and [e:] remaind distinct under certain conditions. In the next paragraph Lass says of the change ME [i:] to Modern [ai]: "In southern English … the modern values were not reached until the 19th century", giving as an example: bite: ME [i:], 1569 [Ei], 19th c. [ai]. And shortly after that Lass gives intermediate pronunciations with schwa and later caret as the vocalic element of the diphthong for 1653 and 1687 respectively. It is incorrect therefore to say that the Great Vowel Shift had ended by the beginning of the 17th century. To come back to the original discussion of the "eye rhymes" in Pope (and many others as quoted by commenters), I should have said that ME [i:] was still undergoing the GVS. The generation of Pope and Chesterfield did not yet use [ai]. So the rhymes are: fords/words, move/love, speak/break. I suppose that they all rhymed when Dyer (d. 1607) penned them, yet it's turned out that none of them rhyme 400 years later. Is it too late to say it? This is simply brilliant. Happened upon it just now and couldn't stop chuckling, along with admiring the amazing deftness of the verse. And this from someone who counts himself, more or less, a prescriptivist.